WHEN: Friday, Sept. 12, 2014; 3 p.m.
WHERE: St. Francis Barracks parade field, Florida National Guard Headquarters, 82 Marine St., St. Augustine, Fla. Officer and enlisted platoons will form at 3 p.m. for the ceremony, and members of Florida Living History will demonstrate a traditional Spanish firing detail. 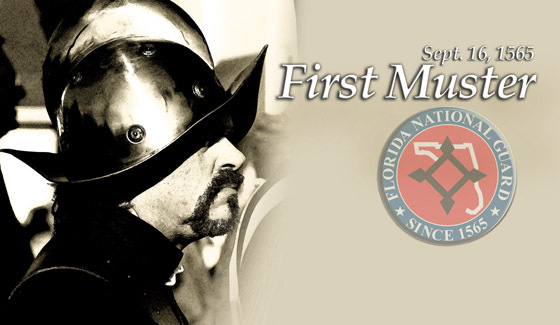 The “first muster” took place on Sept. 16, 1565, when Pedro Menendez de Aviles gathered around him the soldiers of his small Spanish army, as well as the civilian settlers who accompanied him to the newly established presidio town of St. Augustine. He was about to march north to the French settlement of Fort Caroline near the mount of the St. Johns River. Because his plan called for the use of the majority of his regular soldiers, Menendez drew upon Spanish laws governing the milicia, or militia, in an imperial province. As both the civil governor and the commander-in-chief of the military establishment, he had the authority to call all free male settlers in the presidio province to active service.